I just returned from a 10 day trip to Hawaii with my family. It was not just a vacation, but a celebration of my sons' graduating from high school. It got me thinking about the importance of vacations in the scheme of things. "Sharpen the Saw" is the seventh habit from Steven Covey's "Seven Habits of Highly Successful People." He uses the analogy of a lumberjack who works hard, keeps cutting wood, but does not take the time to stop and sharpen his saw. Over time his productivity goes down. The graphs on this page tell the story. 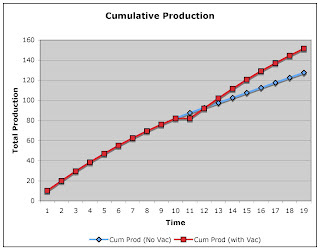 Over time, your productivity tends to go down to some minimum level. If you do not take vacation, you will basically stay at that level. Taking vacation will temporarily drop your productivity to zero. However, it recharges your batteries (sharpens your saw) and you come back as strong as ever. 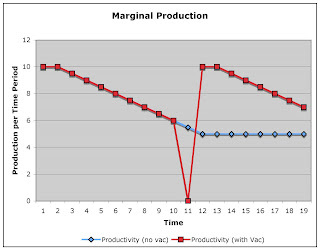 So even though, in the time you are away you lose some ground, in the long run, your total productivity is higher. For me, I find that my productivity does not actually go to zero. Even though I did not do any work, I had a lot of things cranking away in the background. Down time allows me to get away from the tactical issues of any given day and focus on more important and strategic issues. You may be familiar with Covey's Urgency and Importance grid. Quadrant 1 is for the issues that are important and urgent. This is firefighting. there is an emergency and there are dire consequences if we do not deal with it. Quadrant 2 is preparation and prevention. It is front-end loading to prevent things from reaching quadrant 1. It is taking a timeout to sharpen your saw. Quadrant 3 is dangerous, because the urgency of those items makes them seem important. They are items that are important to someone else. Drop-in visitors, some phone calls, some meetings, striving for "perfection" when perfection is not necessary are examples. Quadrant 4 is for activities that are neither important nor urgent. Sometimes, when we are smashed around by Q 1 and 3 activities, we fall into quadrant 4 as a refuge. Excessive mindless television or reading can fall into this quadrant. There is nothing wrong with reading or watching TV per se. Those activities can be quadrant 2, but at some point they shift to 4. In First Things First, Covey contends that we should be spending more time on the important things (quadrants 1 and 2) and less on unimportant things (quadrants 3 and 4). 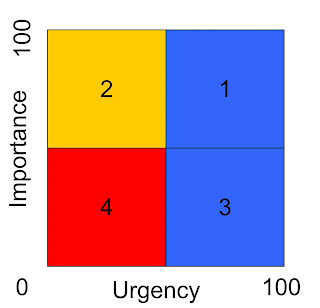 This may seem quite obvious, but many or most people spend their efforts on urgent matters that may or may not be important (quadrants 1 and 3). In other words, while on vacation you are spending time away from quadrants 1 and 3 and living in quadrant 2. Vacation (re-creation time away from work) is not a quadrant 4 activity. As long as our batteries are still recharging, we are in quadrant 2. Steve Pavlina gives some good advice for focusing on the important.